In 2016, nuclear energy provided 20 percent of all U.S. electricity but 57 percent of the nation’s zero-emissions power—more than three times utility-scale wind and solar. Market factors including low natural gas prices are driving the premature retirement of U.S. nuclear power plants. Six U.S. nuclear reactors have retired since 2012 and seven more are set to close by 2025. Globally, nuclear generation is projected to grow by more than 70 percent from 2015 to 2040, driven primarily by rising demand in China and India. Nuclear power is the largest source of zero-emission power in the United States. Ninety-nine operational reactors, the largest fleet in the world, help avoid the emission of 320 million to 578 million metric tons of carbon dioxide each year. Nuclear also provides stable and steady power, which helps ensure electric grid reliability. 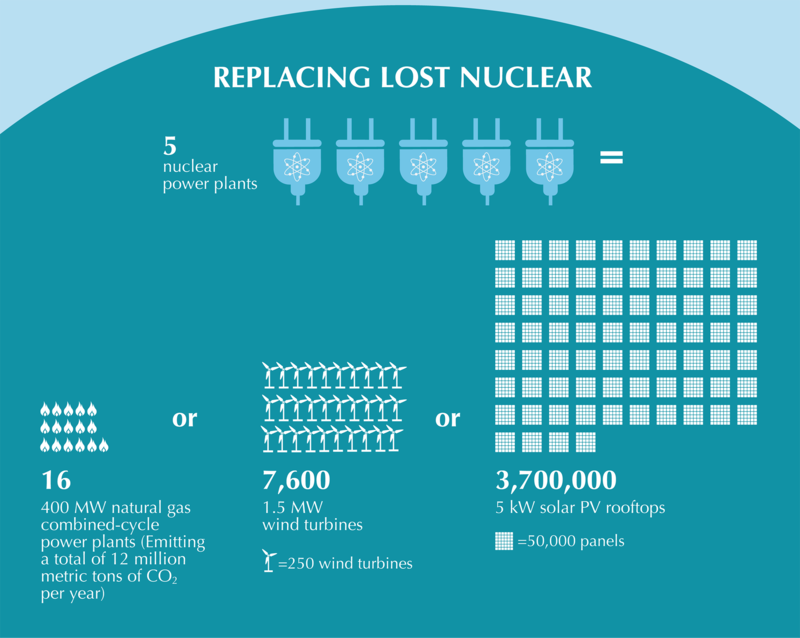 Preserving the existing nuclear reactor fleet can assist in the U.S. transition to a low-carbon future. A robust nuclear fleet, and the supply chains and technical know-how that sustain it, also provide the groundwork for the next generation of advanced reactors. These reactors promise to be cheaper, smaller, and safer. Maintaining a domestic nuclear industry also contributes to national security, as exported U.S. technologies bring with them U.S. safety standards and non-proliferation safeguards. U.S. nuclear plants are being prematurely retired, primarily due to low wholesale electricity prices caused by excess power generation capacity, low natural gas prices, and low growth in electricity demand. Wholesale power markets do not explicitly reward power sources for being reliable or zero-emitting (or penalize sources that emit pollution). Since 2012, five power companies have retired six U.S. nuclear reactors, largely for economic reasons, reducing capacity by 4,800 MW. An additional seven reactors are scheduled to close by 2025, which would reduce capacity by a further 6,441 MW. All the recent retirements led to increased fossil fuel-fired generation, increasing carbon emissions. Though this issue has been prominent for several years, and nuclear power enjoys bipartisan support in Congress, no comprehensive national response has emerged. In the absence of a federal remedy, some states are taking steps to try to preserve the existing nuclear fleet. New York, which gets nearly a third of its electricity from nuclear, enacted a clean energy standard (CES) that includes compensating nuclear specifically for its value as a zero-emission energy source. Illinois passed a law in December 2016 to support two (i.e., Quad Cities and Clinton) of its six nuclear power plants with zero-emission credit (ZEC) payments in a similar fashion to New York. Connecticut, which gets nearly 45 percent of its electricity from nuclear, enacted legislation in October 2017 that will permit its only nuclear power plant to participate in a competitive procurement process with other zero-emission electricity sources provided it is deemed to be in the best interest of ratepayers. But first, the operator must accede to a state examination of the facility’s financial situation by early next year. New Jersey, Ohio, and Pennsylvania are exploring options to support their nuclear reactors. In 2016, TVA brought its Watts Bar 2 unit online, adding 1,150 MW of capacity. Southern Company’s two-reactor Plant Vogtle expansion could be completed in the early 2020s, adding around 2,300 MW of capacity. With a customer in place, an innovative new small modular reactor (SMR) design from NuScale Power is expected to receive design certification by 2020 and be operational by the mid-2020s. Seven construction and operating licenses (COL) have been issued by the U.S. Nuclear Regulatory Commission (NRC) for 12 new nuclear reactors, but companies have not announced whether they intend to break ground on these plants. Nuclear power has received some federal-level support and these tools could be used again to support new nuclear projects. The Vogtle project is being aided by government loan guarantees. Additionally, the 2005 Energy Policy Act created a production tax credit (PTC) for new nuclear power plants entering service before December 31, 2020. Efforts are underway to extend the in-service date. The 2011 nuclear disaster in Japan led some countries to reconsider their nuclear power plans. Japan suspended nuclear operations for most of its fleet, pending strict safety reviews, Germany is seeking to shut down is reactors by 2022, and Switzerland won’t replace its five existing reactors. Nonetheless, nuclear power generation is projected to grow 73 percent by 2040, driven primarily by developing countries, especially China and India. Globally, 440 nuclear electric power plants are operating in 31 countries. Fifty-eight reactors are under construction, mostly in China, India, Russia, and the United Arab Emirates. The main use of nuclear energy is for electricity generation, with limited use on board marine vessels and spacecraft. In 2015, there was 382 GW of installed nuclear power generation capacity in 31 countries. This generated 10.6 percent of total global electricity without direct greenhouse gas emissions. Nuclear power is generated using nuclear fission, which occurs when a neutron strikes the nucleus of a very heavy atom of an element that can sustain a chain reaction, splitting the atom and releasing energy in the form of heat and radiation. The energy released in the fission of one gram of uranium is equivalent to the energy released by combusting three tons of coal. Under precise, controlled conditions, the nuclear fission process occurs as a continuous chain reaction that releases heat in useful amounts to create steam, which turns a turbine to produce electricity. The United States makes up about 26 percent of the world’s total nuclear generation capacity. In 2016, 99 nuclear reactors at 65 plants in 31 states provided about 20 percent of total U.S. electricity (around 769 billion kilowatt-hours). Recent retirements of U.S. nuclear reactors have led to increased fossil fuel-fired generation, increasing carbon emissions. All U.S. nuclear power plants are light water reactors — so called because they use ordinary water to produce electricity, as opposed to heavy water (known as deuterium oxide) reactors used in Canada. There are two types of light water reactors. In a pressurized water reactor, the water passing through the reactor core is kept under pressure so that it does not turn to steam but rather is used to exchange heat with a separate water loop to create steam that powers a turbine-generator. With this design, most of the radioactivity stays in the reactor area. In a boiling water reactor, the water heated in the reactor vessel turns directly into steam to power the turbine-generator. The United States has 65 pressurized water reactors and 35 boiling water reactors. Generation I: Prototypes and first commercial plants developed in the 1950s and 1960s. Very few still operate. Generation II: Commercial reactors built around the world in the 1970s and 1980s. Generation III/III+: Simpler, usually smaller reactors developed in the 1990s and 2000s. They feature passive safety systems, which do not require operator actions or electronic feedback to shut down safely in an emergency. Gen III reactors have been built in China, and are under construction in the United States. Generation IV: Advanced reactor designs anticipated for commercial deployment by 2030 and expected to have revolutionary improvements in safety, cost, and proliferation resistance as well as the ability to support a nuclear fuel cycle that produces less waste. Uranium is a naturally occurring heavy metal whose most common isotope is the U-238, which is not capable of sustaining a nuclear chain reaction. Nuclear power plants predominantly use U-235, an isotope of uranium that can sustain such a reaction, as their fuel. To get the natural uranium into a useable fuel, it undergoes several processes. Uranium is mined using various methods. Most U.S. uranium mines use in situ leaching (ISL), where dissolved uranium is pumped to the surface with the groundwater. After mining, uranium ore is milled and leached with acid, resulting in a concentrated uranium oxide powder referred to as yellowcake. Power plant operators usually purchase yellowcake and then contract for it to be enriched by a third party. Nearly all uranium enrichment is supplied by facilities in the United States, France, Great Britain, Germany, the Netherlands, and Russia. After enrichment, the uranium is fabricated into ceramic fuel pellets and loaded into tubes called fuel rods. A fuel assembly used in the reactor core of a nuclear power plant consists of a square or circular bundle of fuel rods. For more information, see Stages of the Nuclear Fuel Cycle and World Nuclear Organization. When a nuclear reactor’s fuel is spent, or no longer capable of supporting an adequate chain reaction, the fuel must be replaced. Typical reactor refueling intervals vary from 12 to 24 months. Spent nuclear fuel consists mostly of depleted uranium (up to 96 percent) mixed with certain highly radioactive elements—namely, fission products (e.g., cesium and strontium) and elements such as plutonium and americium. The decay heat and radiotoxicity of spent nuclear fuel is dominated by the fission products for roughly the first hundred years and then by the other elements for thousands of years afterward. In 2016, owners and operators of U.S. civilian nuclear power reactors purchased the equivalent of 50.6 million pounds (25,000 tons) of uranium, most of which was imported. The conventional, once-through fuel cycle (the current U.S. approach) involves nuclear reactors that use enriched uranium as fuel and then discharge spent nuclear fuel for disposal. There are two alternative fuel cycles—a single-pass recycle option and a fully closed fuel cycle that would use anticipated advanced technology. The single-pass recycle option (currently used in France) involves reprocessing spent nuclear fuel to separate fissile uranium and plutonium from other nuclear waste. This material can then be recycled for future fuel fabrication, which reduces the volume of nuclear waste requiring disposal but not necessarily the decay heat and radiotoxicity of the waste. A Massachusetts Institute of Technology study concluded that this single-pass recycle option costs more than a once-through cycle, and that the waste management benefits from a closed fuel cycle do not outweigh the attendant safety, environmental, and security considerations and economic costs. In a proposed fully closed fuel cycle, spent nuclear fuel could be reprocessed with the separated uranium, plutonium, and other long-lived radioisotopes recycled as fuel. This could reduce the long-term burden on the final nuclear waste repositories by reducing long-term decay heat and radioactivity. However, it would not eliminate the need for long-term disposal because there are long-lived fission products and wastes from processing operations that will still require permanent geological disposal. A fully closed fuel cycle, however, requires advanced fast burner reactors that are not yet commercially available. In theory, spent nuclear fuel from these fast reactors could be repeatedly reprocessed until all the useable fuel was fissioned while also converting nearly all the uranium in the fuel cycle to useful fuel. While nuclear power emits no greenhouse gases, it has unique challenges, including how prevent the release of radioactivity from a damaged reactor. Since the dawn of the nuclear age in the 1950s, the global nuclear energy industry has experienced three serious nuclear reactor accidents – most recently in 2011 at Fukushima Daiichi in Japan – and several fuel cycle facility incidents. Another challenge is how to store radioactive waste in the form of spent fuel rods. France reprocesses the plutonium from spent fuel rods with uranium, which can be used again in nuclear reactors. The United States does not reprocess spent fuel, in part due to concerns about nuclear weapons proliferation from the plutonium waste, and the cost of reprocessing compared to the once-through fuel cycle. Currently, spent fuel rods are stored onsite at nuclear power plants, initially in specially designed pools which cool the waste for several years, and later in dry storage containers. The long-term storage of these wastes is a major public policy issue. Globally, there is concern about the spread of nuclear weapons, also known as nuclear proliferation. Many technologies and materials associated with civilian nuclear energy can be adapted and used to make nuclear weapons. Organizations like the International Atomic Energy Agency monitor nuclear programs around the world to ensure safety, security, and transparency. Six reactor technologies have been chosen for future development by the Generation IV International Forum for being resistant to diversion of materials for weapons proliferation.